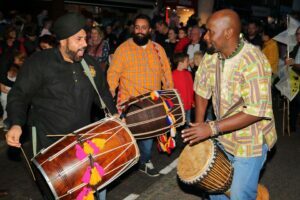 Sittingbourne dazzled with colourful lights as the second Swale Fusion Festival took place on Friday 12th October 2018. 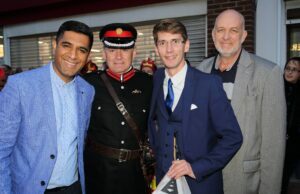 The festival was organised by Cohesion Plus, working in partnership with Swale Borough Council and Kent Equality Cohesion Council. The Festival began in Sittingbourne High Street with spectacular performances from Bloco Fogo Samba, who brought their signature carnival beats to the proceedings, as well as a show stopping performance from the Folk in Fusion Drumming Collective and the Stilt Batteristas, as festival-goers, including Deputy Mayor Cllr Ken Ingleton, enjoyed the spectacle. 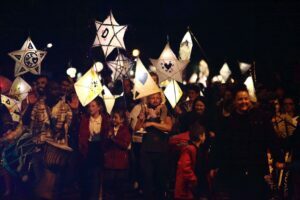 The Festival then continued with a special lantern parade featuring local residents and eight local schools who worked with Same Sky, Ideas Test and Big Fish Arts in the build-up to the Festival. 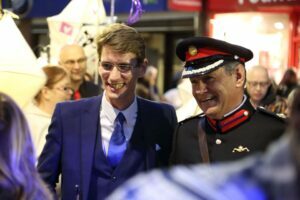 The parade, which at its peak had over 1000 people, was led by the Deputy Lord-Lieutenant Mr Paul Auston, and Cllr Nicholas Hampshire.